This exhibition of enamelled jewellery examines the wearing of insects, beetles and creatures that crawl and fly. In the Victorian period, women wore beetles as jewellery. How do we feel today? Can we overcome our disquiet and see the beauty of these creatures? Can we wear something in public that represents a private fear? Artist Biography: Linda Blair is a Sydney based contemporary jeweller who specialises in enamel with a particular focus on the use of liquid enamel. Linda relishes the potential to play with and push the material in new ways and she likes that liquid enamel allows her to explore the use of colour and a graphic style of work. 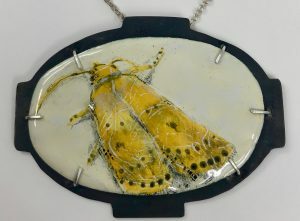 She creates jewellery using colour, texture and a variety of forms.